The Giants hushed all of the doubters on Sunday night with a dominant 38-10 win against the Packers. It was definitely the best all around game the team has played this season. (The rout of the Niners in San Francisco was impressive as well but the Giants scored 5 offensive TDs against Green Bay – as opposed to settling for 4 FGs and just 2 TDs at Candlestick). Eli and Coughlin are always fantastic off the bye week but I was definitely a little nervous going into Sunday night. Coming off 2 losses, including a very bad one to the Bengals, Sunday’s win was vital not only to regain a 2-game division lead but also to beat a hot conference opponent. It’s so fun to watch the Giants when they click on all cylinders. Sunday was another example of how good this team can be when they want to. The upcoming schedule is still very difficult but this was quintessential Giants – a confidence-building win that fans have come to expect over the past 5 seasons. Right when you think they’re down and out, they play a game that leads you to believe they could make a deep playoff run. 1. They are a better team on the road than they are at home. When simply looking at this year’s splits (4-2 at home, 3-2 on the road), it may not be obvious that this fact is true. But when you look at the individual games, the Giants have played much better on the road than at home this season. The only dominant home win was Sunday night’s. Prior to that the Giants eked out victories against the Redskins, Bucs and Browns. They trailed early against Cleveland and Tampa, needing to score 41 points in each game to win and Eli needed a late 77-yard TD pass to Cruz to beat Washington. The two home losses came against Pittsburgh (a winnable game in which the Steelers outscored the Giants 14-0 in the 4th quarter) and Dallas (1st game of the season and a game in which Kevin Ogletree had 114 yards and 2 TD). Meanwhile, the Giants had dominant road wins against Niners and Panthers (outscoring them by a combined 62-10) and willed out a win against Dallas at Cowboys Stadium despite having trouble finding the end zone (5 Tynes FGs). They fell short in Philly but literally by inches as Tynes’ game-winning FG came up just shy of the crossbar. Eli and company were in position to win that game until Hixon committed an offensive pass interference penalty that made Tynes’ FG a lot more difficult. Then there was the blow-out loss at Cincinnati , which I view as an outlier due to the teams’ fatigue having not had their bye week yet. Don’t forget about how well the Giants have played on the road during their playoff runs. During their two Super Bowl runs, they played just one home game. Coughlin knows how to prepare his team for road games. It’s great to have the home crowd and the comfort of your stadium but for some reason the Giants seem to be more comfortable away from MetLife Stadium (both this year and in year’s past). 2. They are nearly impossible to beat when they pressure the QB. The defensive line has been a staple of the Giants’ success in recent years. Teams know they have to prepare for it and the Giants have been hoarding sack machines. JPP is the latest freak athlete to terrorize opposing quarterbacks. He along with the rest of the D-line and linebackers didn’t give Rodgers any time to sit back and do his thing on Sunday night. The result was just 10 points from an offense that had been averaging 30 points a game during its 5-game winning streak. Actually, Rodgers threw a 61-yard TD to Jordy Nelson on his first offensive possession of the game. Then New York held Rodgers and the Pack to just 3 points over the next 55 minutes. The Giants sacked Rodgers 6 times on Sunday night and when they do that, they simply don’t lose. The secondary is average. It has been like that for years and to be honest the way the rules are set up, there isn’t much a secondary can do if a QB is given time in the pocket. Any QB who is given time will eventually find an open receiver and great QBs will shred defenses when they have time. Luckily, the Giants front office realized the importance of pressuring the QB a long time ago. The defensive line can neutralize any deficiencies in the secondary. If everyone can stay healthy down the stretch, the pressure will make it very difficult for any offense to score against the Giants. 3. They are clutch. Any casual football fan knows that Eli Manning is clutch. He set the franchise record for most 4th quarter comebacks last season and he’s engineered 2 Super Bowl-winning TD drives. But it’s not just Eli who is clutch. He is a huge part of the team’s ability to perform when the game is on the line but almost everyone on the team has done the same. In the biggest moments, everyone seems to play their best. Although neither is still on the team, Manningham and Tyree were clutch in coming up with amazing catches during those Super Bowl drives. Cruz has come up huge with long TD catches in key spots (against the Cowboys and Jets last season and the Redskins this season). The defense has come up with timely sacks (Tuck of Brady in both Super Bowls) and interceptions (Blackburn in the Super Bowl). It’s impossible to be clutch all of the time but the Giants and especially Eli Manning seem to have a propensity for being clutch and winning more often than not. 4. They are deep and well-coached. Like every NFL team, the Giants always seem to suffer a handful of devastating injuries. Terrell Thomas’ knee cost him a 2nd straight season this year. The offensive line, which used to be the same exact group game after game, has been mixed and matched due to injury. On Sunday night, Andre Brown was lost for year with a broken leg. He had been such a nice surprise and stepped into Jacobs’ old role better than Jacobs had when he was in New York. It happens to every franchise but the Giants always seem to have an answer. Barden and Randle stepped up when Nicks missed a couple of games. Locklear, Boothe and Beatty all stepped up to fill in on the line when they were needed. Stevie Brown has been an amazing replacement for an injured Kenny Phillips and Prince and Holsey have both seen added responsibilities since losing Thomas. All of them have answered the call. This is a testament to those players and the coaching. The ability to call the next guy up on the depth chart and believe in their ability to get the job done stems from great coaching. Coughlin and his coaching staff know their team very well and the team believes in them as well. Good coaching is a necessity if you want to win in the postseason and the Giants have no shortage of it. 5. They have won 2 of the last 5 Super Bowls. This fact speaks for itself and was obviously a large part of the supporting arguments behind the other 4 facts. Nevertheless, the Giants have made themselves into constant contenders who have not had a losing season since 2004. That’s not an easy accomplishment in the NFL – the league that features such great parity. Given these facts, I don’t know anyone can doubt the Giants as serious candidates to return to the Super Bowl. A big division game coming up this week on national TV. Beating the Redskins on Monday Night Football would give the Giants 8 wins and put them in prime position to win the division. It’s going to be a tough game but I expect the Giants to take care of business. December football is when it gets serious and I’m liking where the Giants are at heading into the final month of the regular season. I’ve written about the importance of the Mets resigning Wright at length so it should come as no surprise that I am thrilled that it happened. A 7-year extension worth $122M on top of the $16M owed to him in the upcoming season means he will make $138M through the 2020 season. That’s a lot of money, especially after paying $19M for Jason Bay to go away, but we knew Wright’s price and it is 100% the right move. The face of the franchise remains just that and Wright is on his way to going down as possibly the greatest position player to ever wear a Mets uniform. He will definitely hold every offensive franchise record by the time he is finished. There’s still a number of holes to fill for 2013 (catchers, bullpen, outfielders to name a few). On top of those, there is also a boatload of question marks (Will Johan be effective? Will the young pitching make an impact? What we will get out of wild cards like Kirk Niewenhuis and Lucas Duda?). Sandy and company have their work cut out for them but I don’t think there are many Mets fans out there upset with this extension. The Wright signing shows the that front office is willing to spend on the future and that’s all I’m asking for. Give me a reason to invest in the team and today they did. Congrats to David and I can’t wait to watch him at Citi Field for the rest of the decade. Last night’s Knicks/Nets game – the first between the two local rivals at the new Barclay’s Center – was electric. There’s really no other way to describe the atmosphere in Brooklyn. Just watching on TV, you could feel the intensity and pride both team’s took in beating each other. The game, which was rescheduled from November 1st due to Hurricane Sandy, was physical and as entertaining of a regular season NBA game I have watched in some time. It felt like a playoff game, especially with Jay-Z and Beyonce sitting courtside. 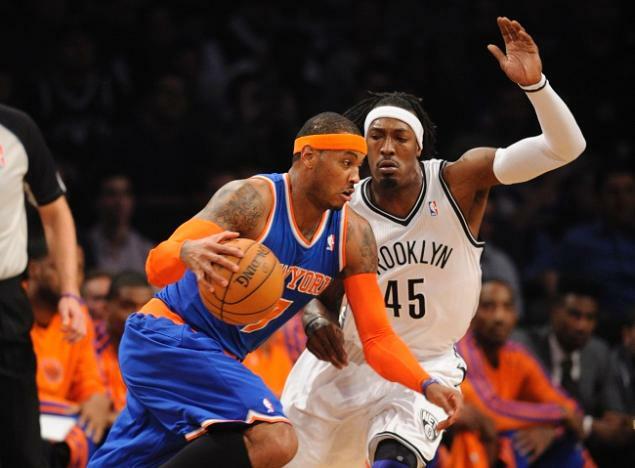 The Nets defeated the Knicks 96-89 in overtime to gain a share of first-place. Williams, Lopez and Wallace all scored at least 16 points and Stackhouse (fittingly wearing no. 42 for a Brooklyn team) added 14 points off the bench including the go-ahead three in OT. Brooklyn native Carmelo Anthony was especially excited for this game and he played like it scoring 35 points and grabbing 13 rebounds. But he also went 10 of 16 from the free throw line and missed a potential game-winning jumper with time winding down in regulation. The Knicks were without Jason Kidd (back spasms), who has been a large part of the team’s early success. The crowd was fantastic and probably skewed 60/40 in favor of the Nets. The Knicks fans made themselves heard even starting audible “defense” chants when the Nets were on offense. After most made baskets, the Nets fans engage in a “Brooklyn” chant which was cool at first but got old quickly. If nothing else, the fans and team seem to have an extreme sense of pride in their new hometown. I also found it awesome that they play rap instrumentals while Brooklyn has the ball. I would love that if I was a player. Who wouldn’t get pumped up while playing basketball and hearing “No Church in the Wild” instrumental in the background? Moving to Brooklyn also opened up a whole new array of songs that Barclay’s could use during timeouts to get crowd hyped. Any Notorious B.I.G. or Jay-Z song usually has at least one Brooklyn reference in it that lends well to a crowd chant. It’s safe to say the Nets did not have this atmosphere at the Izod or Prudential Centers in New Jersey. As a Knicks fan, I was disappointed in the outcome of last night’s game but I’m excited about this budding rivalry. The Garden is still the mecca of sports venues but Barclay’s proved it’s got its own charm. The intensity of the players and fans was infectious and a great sign for the future of New York basketball. Last night was the start of something great and I’m looking forward attending classic Knicks/Nets match-ups at the Barclay’s and the Garden for years to come. (This has been retweeted over 78,000 times by the way). The rumors about a Boy Meets World sequel have been swirling for the past couple of weeks and yesterday Ben Savage made it official. Disney is producing a Boy Meets World sequel cleverly entitled Girl Meets World, with Ben Savage and Danielle Fishel reprising their roles of Cory and Topanga. The Matthews’ will be parenting a 13-year old daughter named Riley. There is even an edgy best friend named Maya, to fill that Shawn Hunter void. Boy Meets World creator Michael Jacobs is behind the project and it seems as if the show will be structured exactly like its’ 90’s predecessor, except of course with Cory in the Mr. Feeny role. I grew up on Boy Meets World and loved the show. I still watch it on MTV2 and although there are many ridiculous things about the show, it is still very enjoyable. Seeing the ridiculousness (Mr. Feeny teaching every grade and Mr. Turner’s leather jackets) and looking at some of the plot lines from an older perspective makes it even more enjoyable. I’m glad that they’re not changing too much. Boy Meets World was successful for a reason so let’s just stick to the script (literally) with the old kids all grown-up and a new set of teens. I really hope Will Friedle reprises his role as Cory’s older brother Eric. As Wikipedia wisely points out, he had an interesting character arc on the original series. “Eric’s character devolves from a suave elder brother to an irrational moron serving as comic relief.” That’s one of Wikipedia’s best quotes and also so true. By the time Cory and Eric were in college, Eric couldn’t do simple arithmetic and you absolutely could not leave him in the kitchen unsupervised. His comic relief was appreciated but if his character continued to get stupider as Cory and Topanga got older, how stupid is Uncle Eric going to be this time around? Even if they can’t get everyone back, it will be interesting to see how this goes. I’ll be tuning in for at least the pilot even though I have no idea where to find the Disney Channel on Time Warner Cable. Is Tom Jackson serious? I need to know what Jay Cutler did to him because Jackson is taking serious unprovoked shots at the Bears QB. There is no way that innocuous pregame video of Cutler walking into the locker room can set someone off like that unless there’s a back story. First of all, the video itself is B-roll meaning it is to be spoken over. Therefore, there is no audio of Cutler and we can not hear if he acknowledges the locker room employees or not. It’s extremely unfair for Jackson to lambaste Cutler after watching that clip from a studio, 800 miles away. Secondly, what does this matter? Does Tom Jackson stop and chat with everyone he runs into while arriving at work? I don’t know but if he doesn’t on any given day, I don’t think he would appreciate having his character called into question over it. It’s no secret that Cutler isn’t the most friendly athlete to take the field, but it’s possible that the negative opinions of him are being unfairly perpetuated by people in the media, like in this case Tom Jackson. For my money, I think he acknowledges the locker room attendants on his way in. Either way, Jackson was out of line. Aaron Rodgers experienced a similar situation after he was called out by ProFootballTalk for not stopping to sign an autograph for a young cancer patient. He was painted as self-absorbed and out of touch but the reality was that Rodgers had signed hundreds of hats, jersey and footballs for that same girl. In fact, she saw and spoke to Rodgers often, usually in the airport after the team plane arrived. On that particular day Rodgers was in a hurry and could not stop. That one aberration suddenly defined who Rodgers’ was and that sentiment was immediately published on ProFootballTalk, a major football media source. The real story eventually came out and ProFootballTalk apologized, admitting that they reacted too quickly and harshly. The NFL is a high-profile league and for good reason. But that doesn’t mean we have to jump to irrational conclusions about its stars to fit our own pre-conceived notions. When I watch NFL Countdown next week, I hope that there will be more game breakdowns and insider analysis and fewer character attacks for what might be an athlete not saying hello to someone. The media is the liaison between the players and the public and I hope it takes that responsibility seriously. On Sunday, Tom Jackson did not. This one-minute clip gives you a pretty good idea of what it has been like in Israel and on the Gaza strip for the past week. Really scary stuff. It’s difficult to comprehend exactly what it must be like when there are missiles flying everywhere and nowhere is safe. The entire world has been on edge since the fighting began. Let’s just hope this ceasefire lasts and the violence is over. Miguel Cabrera won the AL MVP Award on Thursday and it wasn’t as close as the intense debates over the last few months made it seem. Cabrera received 22 out of 28 first-place votes (Trout received the other 6 first-place votes) but just because the writers gave it to the Triple Crown Winner in a landslide doesn’t mean the debate is over. The arguments for both sides have been so much fun and the debate has sparked engaging and intelligent discourse on all media platforms. The fact that it really could go either way with both sides having very compelling arguments made it all the more interesting. Both Cabrera (age 29) and Trout (age 21) are young enough that these intense MVP debates can become annual occurrences. Whoever won deserved it and it has been acknowledged that both Cabrera and Trout had remarkable seasons. I’m happy for Cabrera – I just believe that Trout was the AL MVP. I won’t rehash the reasons or statistics again here. Joe Posnanski does that much better than I ever could and you can read his take on the MVP aftermath. It appears as if Cabrera winning the Triple Crown and his place on a division-winning team tipped the scales in his favor. Mike Trout finished 3 singles short of winning the batting title. Had he gotten 3 more hits this season, Trout would have finished with an AVG of .331, beating Cabrera’s .330 and preventing the Triple Crown. I believe those 3 hits would have changed the vote and Trout would have won. There’s a million different what-if scenarios but 3 hits is so marginal in the grand scheme of a 162-game season. Trout not getting those extra 3 hits allowed Miguel Cabrera to win the Triple Crown, which in turn locked up the MVP. The history and mystique of the Triple Crown is noteworthy but it should not be the deciding factor. One of Joe’s great points is that “Mike Trout could go on to become one of the greatest players in baseball history and still never have another season as amazing as this one.” It truly was a one-of-a-kind season. But a one-of-a-kind season doesn’t guarantee an MVP. Just ask Dwight Gooden. His 1985 season: 24-4, 1.53 ERA with 276.2 IP, 268 K, 16 CG and 8 shutouts. Gooden was just 20 years old when he put up those gaudy numbers and he finished 4th in the MVP voting that season. I’m excited to watch Trout play for the next 15 years. 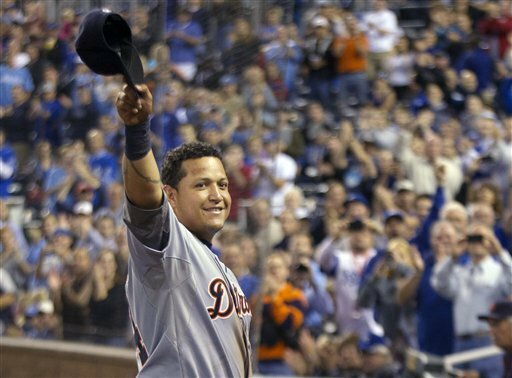 There’s no doubt in my mind that he will continue accomplish historic things on the field – as will Cabrera. As for this season there were 2 fantastic seasons – and only 1 MVP winner. In my mind that MVP is Mike Trout.